dark blue paint in a splashy stripe on my foot. I paint that I forgot a brush fell on my foot. for 20 years. This landscape is part of my psyche. A Grown Up Kind of Pretty. Scotia where we walk on the beach. Starting to prep for the long winter. admiration for all that energy knows no bounds. Labels: Landscape.Tide coming in by the farm. Acrylic on birch panel. Barbara Muir © 2014. Toronto. Canada. oh I LOVE your sky in this one, the rolling clouds! that beach looks just about perfect to me, it's amazing how the beach draws us to it. such natural energy is present at the seaside. Those peaches look spectacular and so do your market flowers...they look fresh from of a shabby chic decor mag. 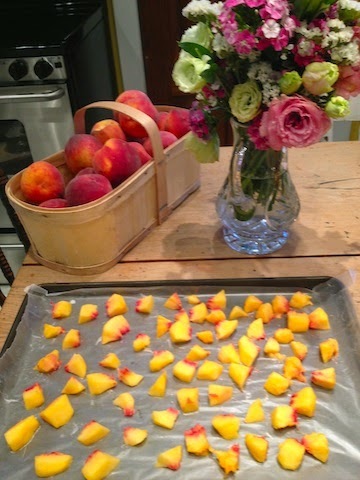 Great idea to freeze those delish peaches...think I'll do the same! Thanks so much. It's true. When the tide is out that whole body of water is gone, and the beach is many city blocks deep, so inspiring. I hope you are having a lovely time with your new grandbaby. Another great sky/beach-scape Barbara! I understand your attachment to the beach. I grew up in the bush and rarely saw the sea as a child but for the last 25 years I've lived just a couple hundred metres from it and now I can't ever imagine being able to live away from it. You will be pleased to hear that there is no such thing as a private beach here in Australia. Every inch of our coastline belongs to everyone! I had been shocked the first time I heard that it was otherwise in some other places. I so enjoy visiting your blog! I am pleased to hear that. I think it's the same in Nova Scotia. Lucky you living so close to the beach. Every year when we come back I think about living that way with great longing. I'm glad you enjoy my blog. I love yours and promise to catch up soon. Nova Scotia is a special place in my life and I have my husband to thank for bringing me there. Those are Nova Scotia clouds for sure. I can smell the sea. Maybe sometime we'll meet up there. I would love to smell the sea. Glad you approve of my clouds.